Rolland Luke Dingman (American, b. 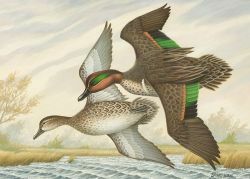 1947) Green Winged Teal. 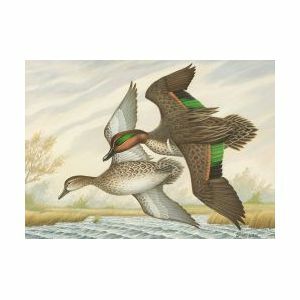 Signed "Dingman" l.r., label from the Federal Migratory Bird Hunting and Conservation Stamp Contest on the reverse. Gouache on paper/board, sight size 5 x 7 in., framed. Condition: Not examined out of frame. Two Aller Vale Devonshire Pixie Jugs. Pair of Longpark Kingfisher Vases and a Lemon & Crute Kingfisher Jardiniere. Longpark Ladybird Hatpin Holder, an Aller Vale Ladybird Chamberstick and Vase, and a German Ladybug Vase. Pair of Watcombe Fruit Blossom Vases, Barbotine Floral Plaque, and an Aller Vale Barbotine Floral Vase. Three Aller Vale Ladybird Vases and a Flowerpot. Aller Vale Motto Ware Daisy Bowl, Ink Pot, and Two Three-Handled Vases, and a Torquay Motto Ware Three-Handled Vase.